Peggy’s data were a bit of a shock. From an anchored vantage point in an expanse of the southeastern Bering Sea west of Alaska, Peggy, or mooring M2, had monitored conditions in the water for 25 years. A line of sensors extended down more than 70 meters to where Peggy was tethered to the seafloor, collecting information on temperature, salinity and other properties of the water. Most years, the waxing and waning of floating sea ice follows a consistent seasonal pattern that is reflected in Peggy’s data. By November, sea ice migrates in through the Bering Strait or forms in some parts of the Bering Sea. As a by-product of the sea ice formation, a large mass of cold, salty water begins to pool near the seafloor. 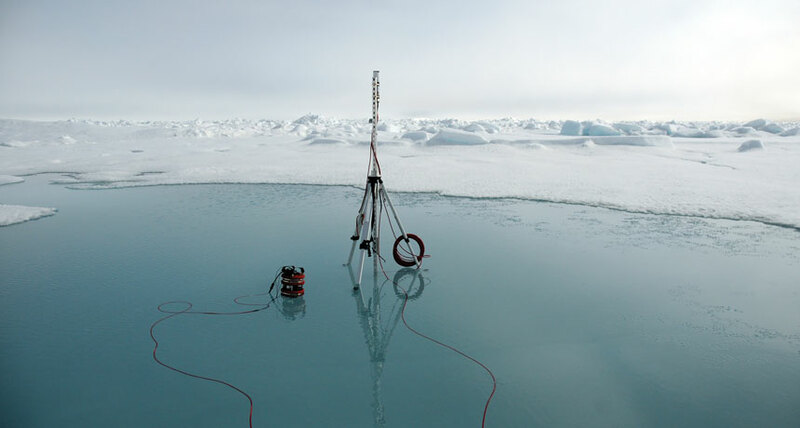 In the spring, phytoplankton bloom, and by early summer, the sea ice begins to melt away. The cold pool, however, lingers through the summer. With an average temperature just below zero degrees Celsius — a few degrees colder than the surrounding water — that deep, cold pool is central to the Bering Sea ecosystem. The cold pool is where Arctic cod take refuge, hiding from predators such as Pacific cod and pollock, which are less tolerant of the cold. The Arctic cod get fat on large, shrimp-like copepods and spawn their young. In turn, the fish keep polar bears and seals well-fed. But in the winter of 2017–2018, the sea ice never appeared. And Peggy’s data, along with that of other moorings, revealed that the cold pool was AWOL too. Alarm trickled through the ocean science community, researchers who study everything from the physics of the Bering Sea to the small creatures that live on the seafloor and the larger marine mammals at the top of the food chain. In December in Washington, D.C., at the American Geophysical Union’s annual meeting, these researchers gathered to present their data, trade stories and ponder what it all means. Were these findings a fluke? “We don’t yet have enough data” to say whether the Bering Sea is increasingly likely to be ice-free, says Jacqueline Grebmeier, a biological oceanographer at the University of Maryland’s Center for Environmental Science in Solomons. But Grebmeier, who has studied seafloor life in the Arctic for more than 30 years, has “a gut feeling,” she says, that it’s not a one-off incident. “I think it’s the beginning of change.” If last year’s events represent a new normal for the Bering Sea (and the very low sea ice extent as of February this year signals they might), then a cascade of changes are in store for the complicated ecosystem that has long thrived in those waters — and for the fishing and tourism industries that rely on the area’s bounty.